Chocolate Yogurt Mousse Tart is a delicious chocolate tart that is filled with lip smacking silky chocolate yogurt mousse and frosted with chocolate ganache and garnished with nutty caramel. Does that sound tempting? 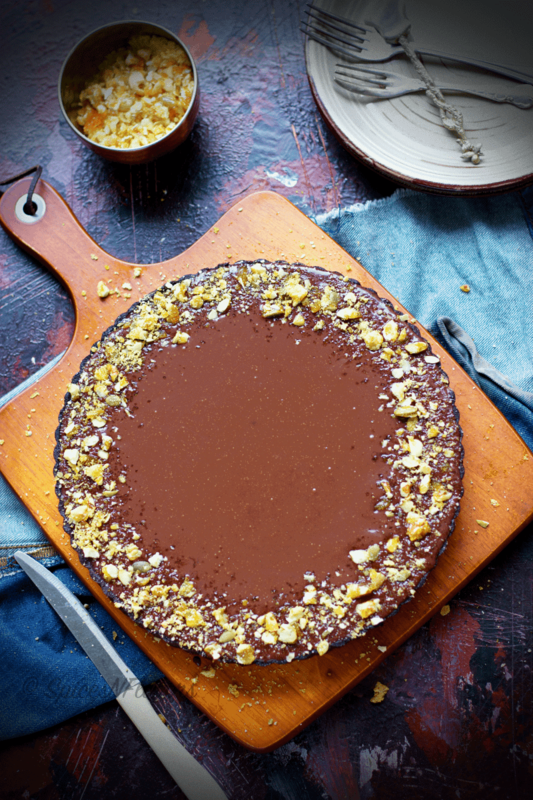 Chocolate Yogurt Mousse Tart is like chocolate heaven; a treat for all chocolate lovers!!! This is so chocolaty that you would you go bonkers after each bite craving for more and more. This post was supposed to go live on Thursday as per my schedule of posting every Tuesday and Thursday but then this beauty took a little longer to put together than I had thought. And I also could not do justice to the tart through my photography today. So it took me another day to capture its beauty. 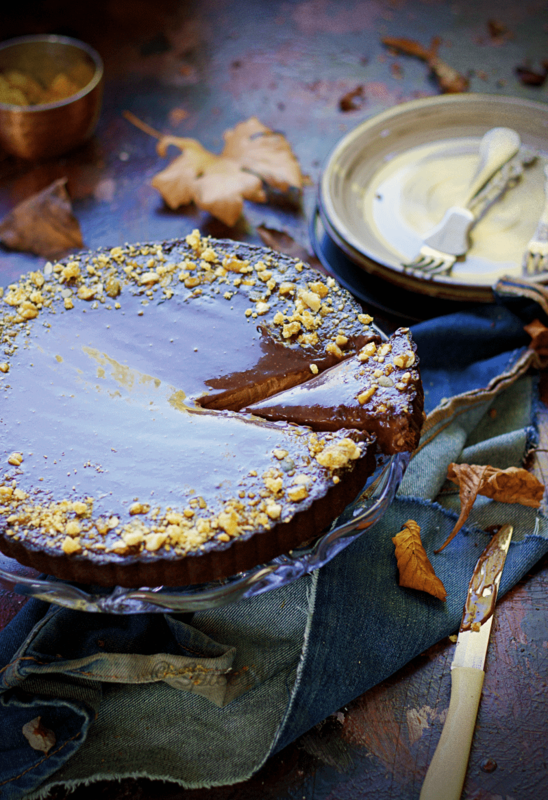 Why did I bake a Chocolate Yogurt Mousse Tart? Well, it all began with switching on the, “Maruvartai Pesadha” (regional language) song on youtube. The song is so romantic that it just made my mood and I started baking; Yes I absolutely love baking and it comes naturally. I didn’t had a set recipe for this chocolate yogurt mousse; I however have learnt making tart at school. So it was kind of an instant recipe and I am glad I came up with this. I simply love this beauty. It was sunset. I watched with an unfaltering gaze, the red orb sank beneath the horizon, draping the sky in the shades of red, orange, then dark blue and all that was left was the moonlight and the twinkling stars. The table was set, the candles were lit. He was seated opposite to me. With a glass of wine, our eyes met. His sparkling eyes were charming under the twinkling stars as always that made me glow hot as if bathed in sunlight. We ate our dinner with non-stop chatter followed by a deep silence; holding hands. The mood was set and my dessert arrived. 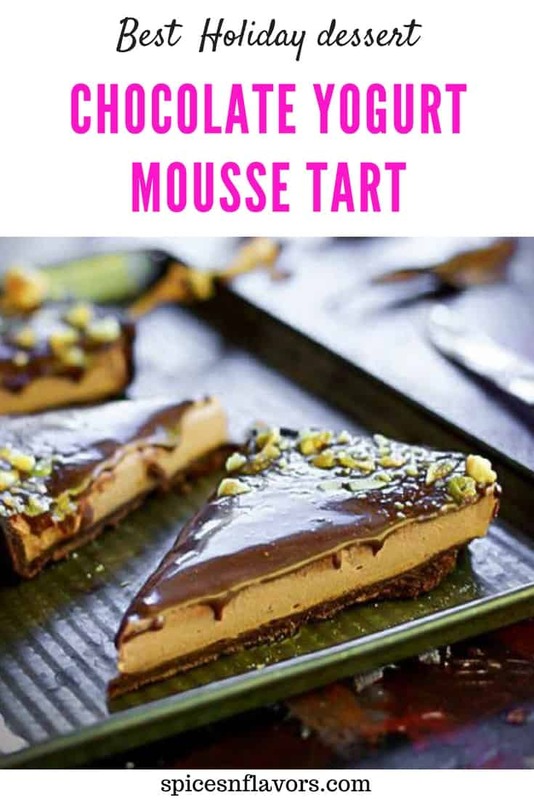 The brittle base with the crumbs of chocolate giving way to the silky, smooth slightly tart chocolaty melt in the mouth delight with the crackling caramel nuts in your mouth; leaves you with an exotic taste of chocolate lingering in your tongue. This Chocolate Yogurt Mousse Tart is perfect for one of those romantic dinner date. I am sure he will love you more for this lip smacking finger licking dessert that you made to make your day special. When I say this is a special dessert. I mean it by all. 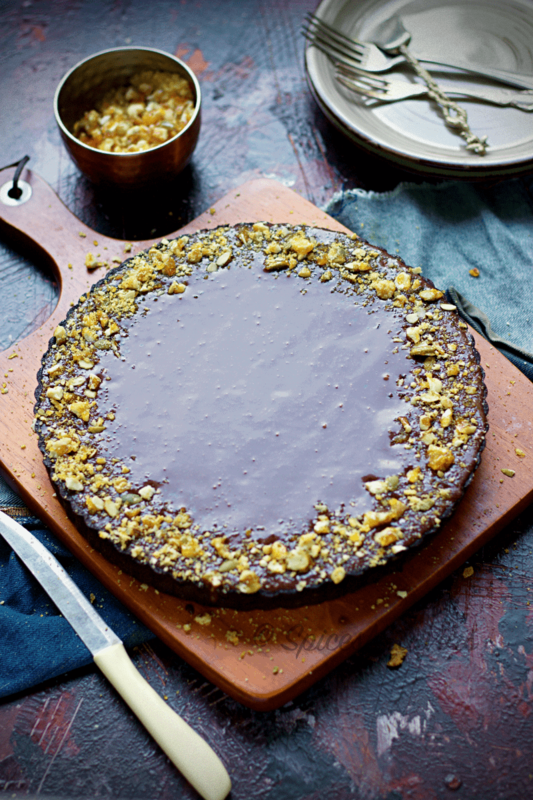 I won’t lie to you but this dessert; the Chocolate Yogurt Mousse Tart takes a lot of passive time. 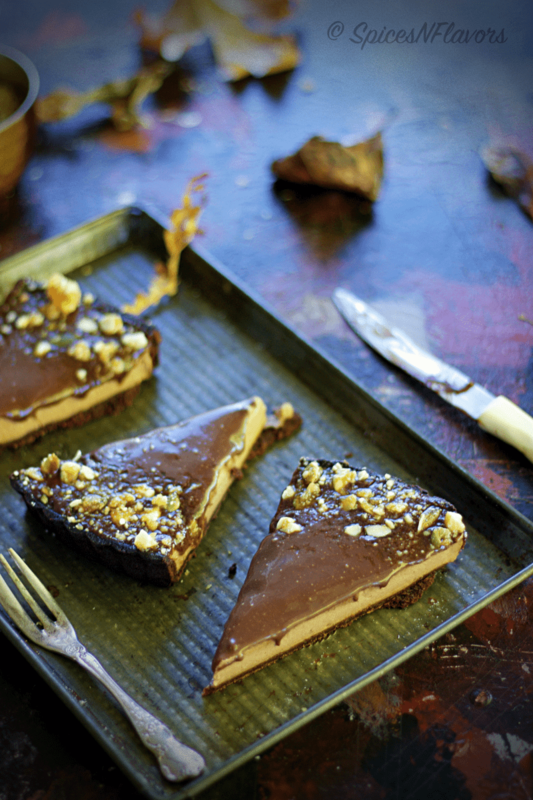 This is not one of those many desserts I have shared before which you can make in a jiffy. If that is what you are looking for then check my Caramel Banana Cottage Cheese Parfaits; that you would love too. This is also an easy to make dessert. But you need little bit patience to make it; as it involves a lot of steps unlike my no churn ice-creams or chocolate barks. To begin with you will have to bake the base of course; and it requires a lot of resting time in between. Then comes the mousse layer which needs a minimum of 4 hours to set. 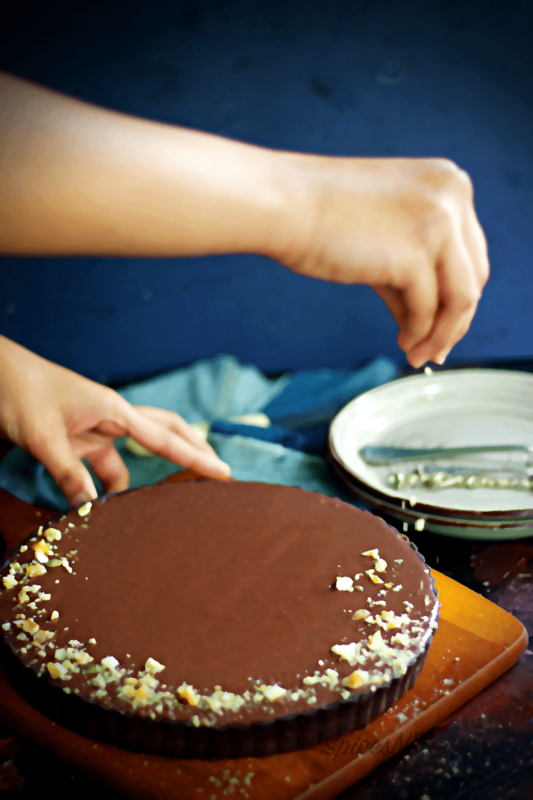 We are also topping it off with some ganache and even it takes hours together to set. So basically you would require a day or day and a half to put this together. 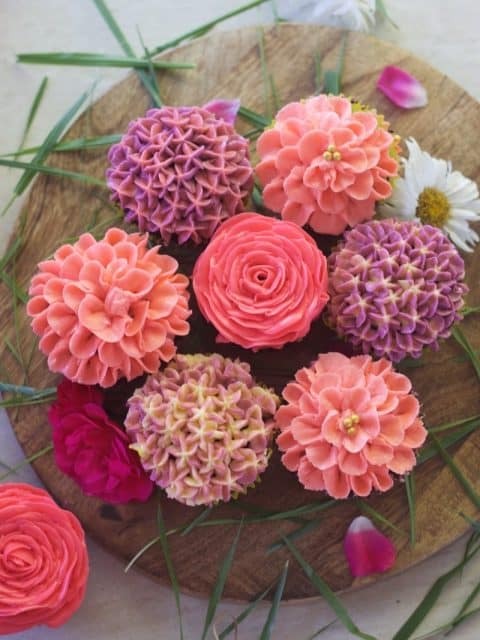 But this is such a wonderful show stopper recipe that you must make for your next party. I have never made a mousse using yogurt; but what is life without experiments. My go to strategy whenever trying out a new ingredient or recipe is to add chocolates to it; mark my words the dessert will always be a hit even if you do some mistakes. This Yogurt Mousse was one such experiment. My next week’s assessment involves making Fruit Flan so it was obvious for me to bake it this week. And that is when I thought of filling it with Yogurt Mousse instead of the Patisserie cream and so I twisted the base recipe to make a chocolate tart, filled it with mousse and topped it with ganache and sprinkled it with caramel nutty. You could however just leave it at the mousse layer if you wish to or if you are falling short of time; it would taste equally good. I also have a step by step detailed recipe for you guys..
Add the sieved dry ingredients – flour and cocoa powder into a mixing bowl. Rub in the softened butter using the paddle attachment on low speed for a minute and then on medium speed until the mixture resembles like wet sand. This would take about 4-6 minutes. Take the sugar, egg and vanilla in a bowl and whip until combined. Combine everything to form a dough and then pat it down to form a circle. Cling wrap it and place in the refrigerator for 20-30 mins. Note: The thinner you pat the quicker it will chill. After 30 mins, roll out the dough to 3mm to produce (1) 20cm tart base. Remember to dust your working table with flour. And keep moving the dough as and when you roll it. Pick the rolled out dough with the help of the help of the rolling pin; dust off excess flour using pastry sheet and place it on the prepared tin. Immediately lift and push the dough to the base of the tin and along the sides; to avoid any shrinkage while baking. 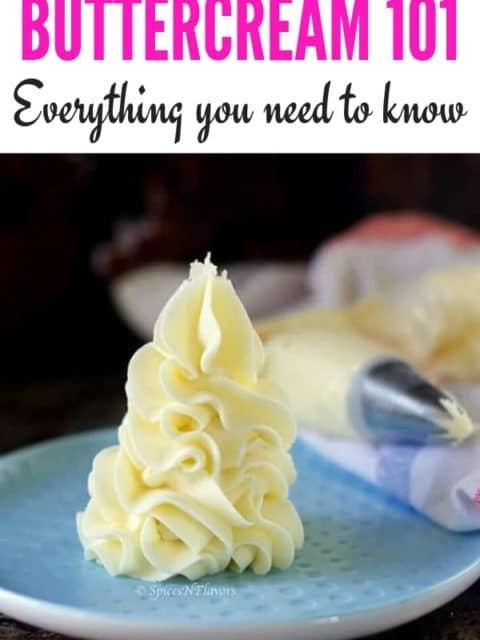 Once you have pressed the dough to the sides and base of the tin; cut off the excess dough by pressing the dough to the tin with the help of your hands. And then trim off using the unsharp side of the knife. Let it rest in the fridge for another 30 mins. After 30 mins, blind bake the tart or flan using a cartouche. After that remove the paper and bake for another 4 minutes until the tart starts leaving the sides. 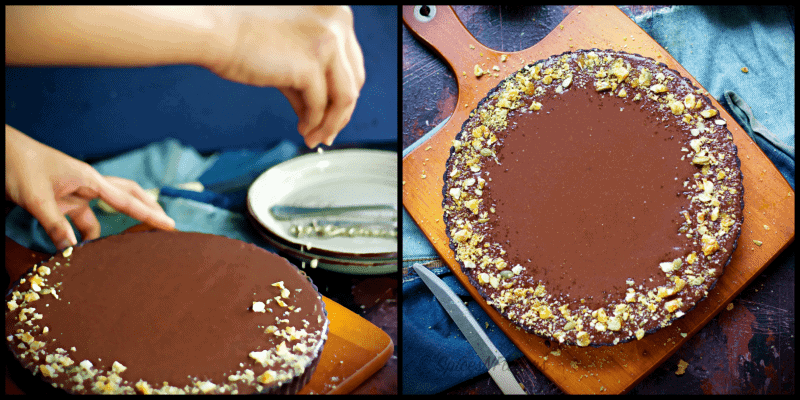 Once baked; immediately brush the tart with some melted dark chocolate. To prepare the mousse, whip the cream with icing sugar until stiff peaks form. In another bowl combine together yogurt, chocolate and vanilla and blend well. 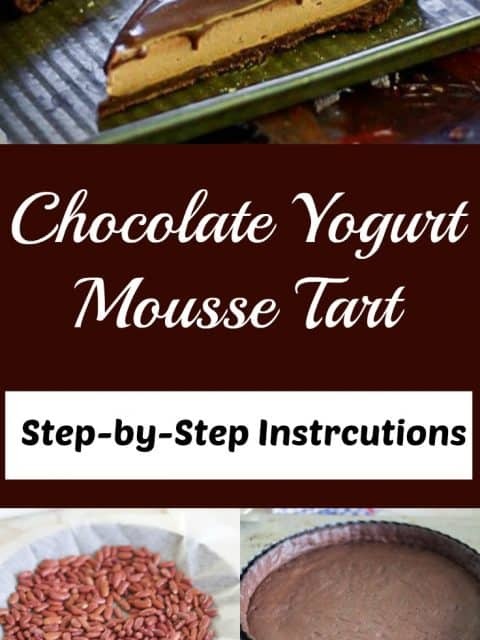 Add this yogurt chocolate mixture to the cream in two stages until well combined. Pour on top of the completely cooled tin and let it sit for a minimum of 4 hours or until set. To prepare the ganache first weigh out the chocolates in a bowl. Heat up the cream in a saucepan; once it just starts to boil add the cream on top of the chocolates and stir until all the chocolates are dissolved with no lumps. Let it cool a bit and keep it in the fridge for approximately an hour. Then pour over the set mousse layer. Let it sit overnight or until set. Finally garnish with some caramel nutty. To prepare the caramel nutty heat up sugar in a saucepan and once all the sugar is completely melted add the nuts to it give it a stir and pour it on to a well greased aluminium plate. Once cooled take it off; pulse it in a mixer and use this caramel nutty as a garnish. Enjoy this dessert on special occasions.. I know it takes a lot of passive time and patience but the end result is like enjoying a treat from 5 star rated restaurants. 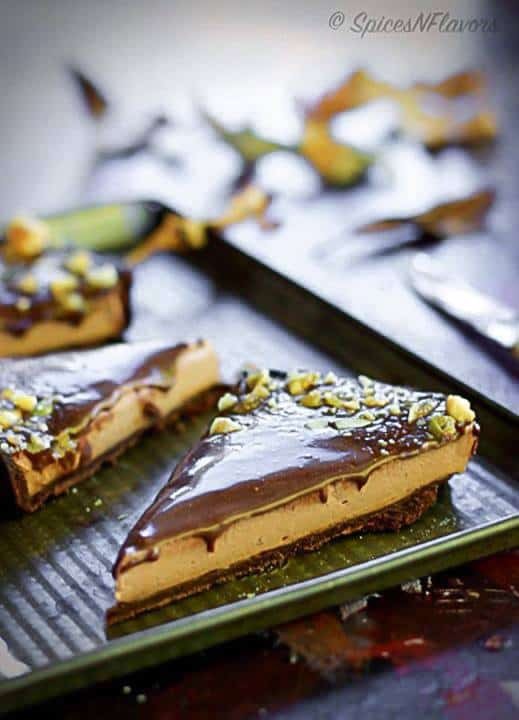 Chocolate Yogurt Mousse Tart is a delicious chocolate tart that is filled with lip smacking silky chocolate yogurt mousse and frosted with chocolate ganache and garnished with nutty caramel. Sieve the dry ingredients. Rub in the softened butter until the mixture resembles wet sand. Beat the eggs, sugar and vanilla in a mixing bowl until combined and add it to the flour. Mix until just combined. Remove the mixture onto your working surface and make a dough. Pat it to form a circle. Cling wrap the dough and chill for 20-30 mins. Dust your table with flour. Roll the chilled dough to 3mm to produce (1) 20 cm flan base. Lift it up with the rolling pin; dust off any excess flour and cover the tin. Immediately lift and push the dough to the base and sides of the tin to cover everything before it cracks. To remove the excess, press the dough on top of tin and then with the unsharp side of the knife trim the excess. Let this sit in the refrigerator for another 30 mins. Blind bake tart base, using a cartouche (check the detailed step by step instruction above) for 15-20 mins at 180°C. Then remove the parchment paper and bake for another 4 mins until the tart starts leaving the sides. Whip the cream with icing sugar until stiff peaks form and keep aside. Melt the chocolate in the microwave in short intervals and when warm to touch add it to the yogurt along with vanilla. Mix until well combined. Add the chocolate yogurt mixture to the cream in two parts. Pour over the cooled tart base and let it sit in the refrigerator for a minimum of 4 hours or until completely set. Weight out the chocolate in a bowl. Heat up the cream in a saucepan. Once the cream just starts to boil take it off the flame and pour on top of the chocolate; stirring continuously until chocolate is melted without any lumps. Let it cool a bit and place it in the refrigerator for approximately an hour or until it reaches a pouring consistency. Test: the mixture should coat the spoon completely. Pour over the mousse and let it sit overnight. Heat sugar over medium flame in a pan. Once all the sugar is melted and it resembles a golden amber colour add the mixed chopped nuts. Stir. Pour this on a well greased aluminium plate and let it cool. Once cooled remove and pulse it in a mixer. Use as a garnish. 1. 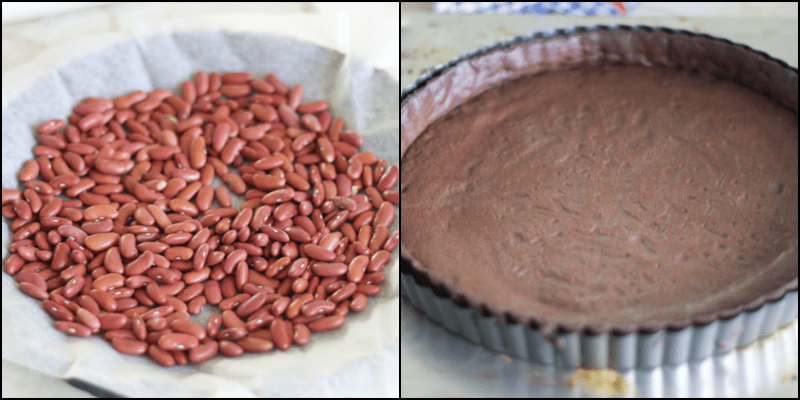 Even though the recipe calls out for a 20cm Tart Tin for this Chocolate Yogurt Mousse Tart I have used a 25cms Tart Tin as I could not find a 20cm tin in local stores. 2. Since I had rolled the dough a little bigger to fit my 25cms Tin it started cracking. But that is completely alright. Just bring the cracked edges together and keep rolling. 3. If the dough breaks while sticking it to the sides of the tin. Do not worry just take small pieces of the excess dough and stick it to the sides of the tin. 4. It is important to stick the dough to the sides and edges properly in order to avoid shrinkage. 5. It is important to use conditioned butter. 6. Like I said earlier I did not have a set recipe for this. Apart from filling the tart, I am left with a medium size mason jar filled with the yogurt mousse. So the next time I make it I will reduce the quantity of yogurt and chocolates by 100 gms. 7. The ganache was of the perfect measurements. 8. 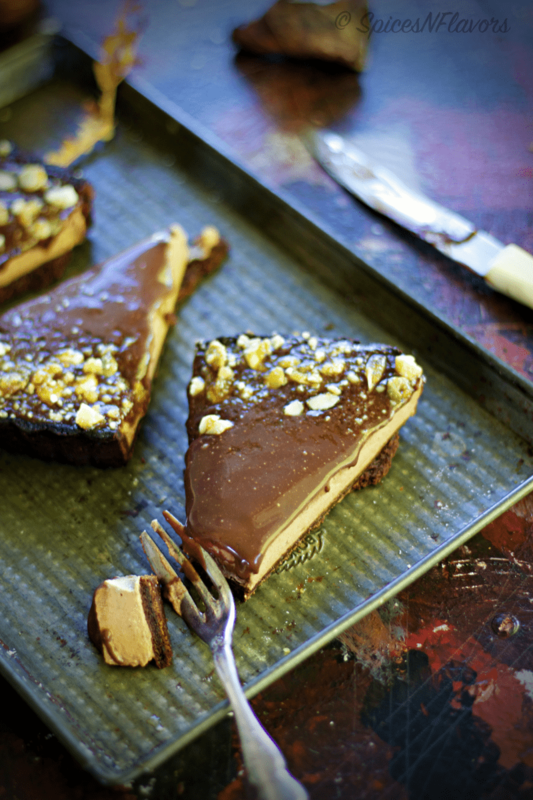 Instead of making the caramel nutty, you could also just use finely chopped nuts as a garnish. Also like the next time I try this out, I will just use 1/4 cup of sugar instead of 1/2. 9. You can also go for a no bake base recipe using Oreo biscuits. Simply grind the oreos add some butter and use this as a base in case you are not in a mood to bake or in a hurry to prepare a dessert. 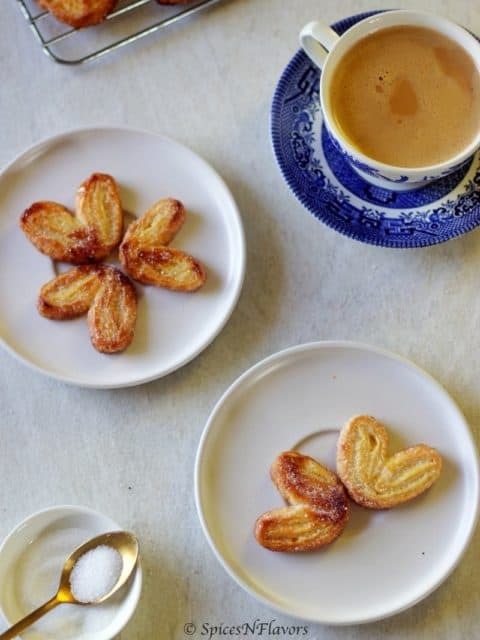 If you try this recipe or if you have any doubts with the recipe just tag me, tweet me or instagram me, I would love to connect with you. This looks absolutely beautiful… It shows how much time and care u have spent on it… Great pictures…. Absolutely love it…. Aww.. Thats really sweet of you to take the time out and appreciate my work.